Bonding with teen writers, LOL…. I created WANA methods to let writers focus on what we are best at doing—writing. The WANA approach works. It’s been responsible for selling millions of books and for elevating unknown authors onto best-selling lists. WANA methods are responsible for the 11th best-selling e-book in UK history. Normally, I would just ignore this message, but after being fried from working three weeks straight and being on the road, I replied. Also, I’ve spent the past week yelling at idiot taxis in Manhattan and the New Yorker in me was coming out. By the way, the assertion that no one else had taken offense? I highly doubt it. I just happened to be tired enough to call out the offensive nature of the message. Also my mother is from New York, so I blame it on her :D.
Aside from Kristen shouldn’t answer e-mails when tired because she has the skin of a grape. Maybe I shouldn’t have engaged this person, but I love writers. Love is not always a fluffy bunny hug. Love sometimes need to be tough and it needs to confront. I know this writer didn’t sit up all night thinking of ways to insult his following, but he was doing just that. This author had clearly been among my Facebook friends for some time and I have to admit, I was pretty hurt by how this message treated me. Yes, I do have feelings. But essentially, what this writer was telling me is 1) we aren’t friends 2) we aren’t colleagues 3) oh, but please take your time to go Like my fan page so I can later sell you a book which will require your money and 12 hours of time you don’t have. Yep, I’m right on that. Aside from the NSA checking in, we don’t have “privacy.” Privacy on-line is an illusion. But if we DO want some privacy on FB (like sharing pictures of kids), we don’t need to resort to ticking off our followers by telling them they are a non-entity who are only valuable when they can buy a book. And if you don’t know how to do this then take one of Lisa Hall-Wilson’s classes over at WANA International. I personally don’t like lists for a number of reasons, but they are an option. I feel lists can give us a false sense of security that can create a mess. All it takes is an oops on our part or Facebook’s part for that “private” information to be everywhere. I believe that if everyone can’t see it? Don’t post it. Get on the phone or send an e-mail (and then only the NSA will see it). We never know who is watching. I have writers who segment all their writing posts to people they only believe will care about writing. We have no way of knowing what others find interesting and it is presumptuous to assume this person or that person won’t care. I have FB friends who aren’t writers. But guess what? When their first cousin is writing a book, guess who they tell dear cousin about? ME. Maybe someone following you doesn’t read high fantasy (and you write it). But maybe, if you are a cool person, they will read yours. Or, maybe they have a coworker who LOVES high-fantasy. Who will they recommend? This is that whole “word of mouth” thing, by the way. There is a HUGE misconception that the regular profile page is for acting like a human and interacting and then a fan page is for the professional face and self-promotion. WRONG. This is why so many fan pages get dismal traffic and the author (in desperation) resorts to paying to promote (which won’t do anything and is a complete waste of money). The WANA International fan page regularly has over 80% engagement and we don’t pay to promote. We use WANA methods. The regular page is essential for connecting with people and creating the emotional bonds that will eventually translate into a vibrant, passionate author platform filled with readers. We connect talking about kids, laundry, missing socks, vacations, hard days at work and griping about the weather. All these everyday events are how we forge friendships. Who cares if someone only buys one or two books a year if they are YOUR books? People default to who they know and who they LIKE. The personal page is one of the best ways for others to get to KNOW and LIKE us. Advertising, marketing and promotion without relationships DOESN’T WORK. 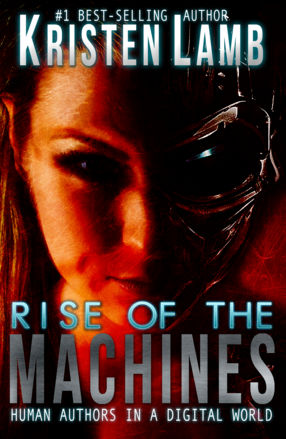 Marketing doesn’t sell books and I explain why in my new book Rise of the Machines–Human Authors in a Digital World. I’m saddened that this author didn’t believe we were friends or colleagues. I believed we were until I was informed otherwise. I go out of my way to help my fellow authors and might have been a good ally to have, especially since this person has a book coming out in the fall. Also, I talk about zombies and Star Wars and quote Monty Python far more than is socially acceptable :D.
So before you start a fan page, I recommend you get educated how to do it. Either invest a whopping nine bucks in my book or take a class at WANA. And I don’t say this to sell, sell, sell (heck, search my archives here or go read Lisa’s blog for free), but mistakes like the one above can seriously damage a brand. How many people got that message and they not only ignored it, but they were hurt like I was? …only they remained silent. Can guarantee they won’t be buying or recommending this author’s books. And if you’ve made this mistake, just don’t do it again. I learned how to do social media by doing A LOT of stuff wrong. We learn by mistakes, but I am here to help writers (hopefully) before you make them or maybe at least explain why you might not be getting great results. Remember, on social media, everyone is our friend. The more “friends” we have, the better and stronger our platform. If we whittle this down to only people we’ve personally met? We are balancing our careers on digital toothpicks. What are your thoughts? Have you gotten messages like these? Were you hurt or offended? What did you do? What are some other Facebook faux pas that make you see red? What are Facebook questions you might have?